I woke up this morning to read the news of the horrific terror attacks in Brussels. My heart feels heavy with the burdens of fear, poverty, and violence in our world. It’s hard to build authentic safe havens in a time of uncertainty, hostility, and apocalyptic fear. When fear dominates our cultural and emotional landscape, we understandably want to find shelter. It’s natural that we seek it in our spiritual communities. Unfortunately, in the face of fear, churches and religions sometimes unwittingly abandon true safe havens (e.g., a spirit of love, belonging, tolerance, invitation, potential, and freedom) in favor of more restrictive fundamentalist values and practices. Communities that could offer warmth, freedom, and potential can transform instead into suffocating straitjackets of fundamentalism. What kind of communities do we want to create? Xenophobia: e.g., “Others are dangerous and not to be trusted.” In fundamentalist groups, this can also take the form of blaming problems on others, vilifying certain groups, and promoting a “victim” narrative disproportionate to real persecution. Authoritarian Certainty: In fundamentalist groups, the opinions and pronouncements from authority figures are treated as infallible. Everything has to “fit” within the existing narrative dictated by those in authority. Fundamentalist authoritarian certainty promotes low tolerance for disagreement, questions, and open dialogue. When people or groups question or disagree with authority figures or cultural norms in a fundamentalist community, they are often punished, excluded, or marginalized. Anti-Learning/Anti-Science: Questioning or looking to outside sources of knowledge is discouraged or treated with skepticism. In extreme forms of fundamentalism, searching and questioning is banned outright, and is sometimes considered as evidence of sin and faithlessness. Literalists regarding canon/scripture: Fundamentalist groups are often intolerant of divergent interpretations of scripture. They emphasize “black & white” interpretations, and gloss over nuance and ambiguity. Male dominated: In many fundamentalist groups, women and children often come as an afterthought, if their voices and needs are considered at all. Fear & Guilt: In order to preserve group loyalty and compliance to authority, fundamentalist groups often use fear and guilt to motivate their members. Fundamentalist tendencies (driven by fear and pride) have existed throughout human history. Undoubtably, these rigid approaches have helped some groups survive times of violence and physical threat. But there are huge downsides to the divisiveness of fundamentalism within our contemporary pluralistic society. I believe that we cannot find true safe havens within fundamentalism, because fear never leads us ultimately to truth and connection—Only love can do that. If we want to build healthy, vibrant spiritual communities that offer the best gifts of love and belonging, we have far more beautiful alternatives than the straitjackets and walls of fundamentalism. Safe spiritual communities provide refuge, healing, belonging, and community. But safe havens aren’t meant to become straitjackets or prisons of fundamentalism. Safe havens exist not only to provide warmth and shelter, but also to help us launch more joyfully and confidently into the world outside. Paradoxically, the more secure we feel inside our spiritual communities, the more we’re empowered to go outside in our search for continued light and knowledge. Genuine belonging and identity grounds us, giving us confidence to explore, to grow, and to discover new things beyond the shelter of the familiar. Building secure bonds with our communities challenges us to build reciprocal trust. For their part, our communities can trust and encourage us to go into the world with open hearts and eager minds. As we learn outside truths, we reciprocate that trust by returning to our communities to thoughtfully share what we’ve learned and how we’ve been challenged to grow. Secure bonds with our communities reassure us that we can always find refuge in our spiritual home. Rather than feeling threatened by our differences and discoveries, our communities honor them as valuable contributions to a greater, ever-improving whole. We can focus on UNITY, allowing our common love for God and each other to draw us together, rather than focusing on UNIFORMITY (i.e., expecting people to think, believe, act, and dress the same). We can embrace our differences as beautiful manifestations of the variety in God’s creations. We can see our diversity as a catalyst for discovery, and as God’s loving challenge for us to grow. We can engage with each other in open and loving ways. We can look for inspiration and truth from children, laypeople, and leaders alike; I don’t believe God limits himself to working through only a select few. We can ALL learn so much from each other. We can be humble—we can believe that God has so much more to teach us. Instead of keeping a death-grip on limited narratives, authoritarian certainty, and cultural conventions, we can hold tightly instead to the hand and love of God as we continue our search for truth. We can nurture hope and resilience. Of course it’s a tough world out there. But there’s so much beauty and goodness too. There are always, always, always good people trying to make things better, and we too can be part of the solution. We can create a sense of community based on love and inclusion rather than on pride, exclusion, comparison, and judgement. We can learn to appreciate mystery, nuance, and ambiguity. Rather than trying to catalogue and define everything (and then measure ourselves and others accordingly), we can fall in love with trusting God’s goodness while not knowing all the answers—and rescue our faith from the limitations of certainty. We can honor our questions and encourage others to do the same, without creating artificial tug-of-wars about who has the “right” answer. 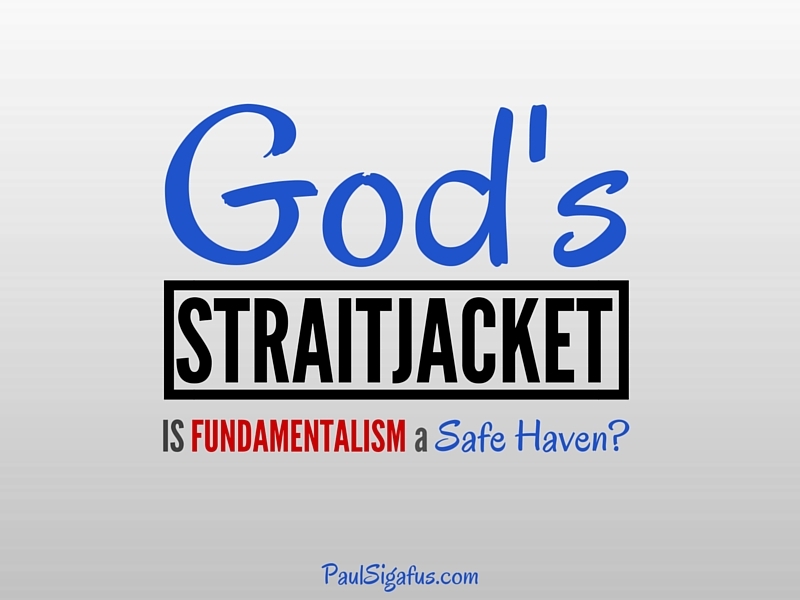 God doesn’t need a straitjacket—we can embrace “the glorious freedom of the daughters and sons of God.” (see Romans 8:21) With so much possibility surrounding us, why seek shelter in the straitjackets and confining walls of fundamentalism? Rather than living in fear, let’s learn how to listen to God’s loving, unifying, and very personal invitations and challenges. We can learn to trust each other. We can courageously choose love and inclusion as our path, and create true safe havens in this beautiful and challenging world. If you know someone who could benefit from these thoughts, please feel free to share this on Facebook by clicking the button below! And, as always, please feel free to leave comments below; I love to hear your thoughts. So do you believe the LDS church is fundamentalist? VMJ — I think it depends on the ward and stake… Like in any church/religion, there are members of the LDS church who gravitate toward fundamentalism. There are also many members in the LDS church who don’t take a fundamentalist approach toward their faith. It’s probably too simplistic to say that the LDS church or its members fall neatly into one category or another. In my view, fundamentalism creates problems wherever (and to the degree that) it arises–whether in Evangelical Christianity, Islam, the LDS church, Alcoholics Anonymous, or anywhere else. I especially like the idea of learning to be okay with ambiguity. That can be tough for some because it means that we do not have all the answers. It means that someone else may see it differently. It means we do not have total control. How can we teach this to each other and our children? to be happy and content with not all the control? I think we can learn something from our Eastern spiritual friends about being okay with letting go of control and having it all figured out?